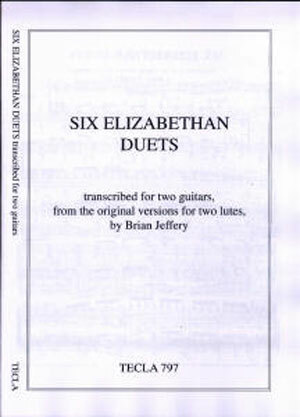 These six duets were originally composed for two lutes, and have here been transcribed for two guitars by Brian Jeffery from the original tablature. They will make a fine collection for anyone wishing to play guitar duets. The first two pieces are charming and very easy. They are presented here in score. The collection was previously published by Oxford University Press and has now been assigned to Tecla Editions. Lute duets are among the most attractive of Elizabethan consort pieces. Here are six of them transcribed for two guitars. Le rossignol imitates a nightingale, The Flat Pavane and The Galliard to the Flat Pavane are more serious, while My Lord Chamberlain’s Galliard may even be played as a duet for ‘one guitar four hands’. The ornaments in the Lesson are probably to be interpreted as mordents or short trills. John Dowland’s My Lord Chamberlain’s Galliard was printed in his First Book of Airs of 1597. The Lord Chamberlain of the time was George Carey, Baron Hunsdon (to whom the First Book is dedicated, and for whose wife Dowland’s alman My Lady Hunsdon’s Puff is named). It is marked ‘for two to play on one lute’, and it can indeed be played on one lute (or one guitar), but personally I find it musically more satisfactory on two instruments. The ‘Cantus’ part is in fact found by itself in one Elizabethan source, suggesting that the piece was even then sometimes considered to be for two instruments.